By: Mike Foster, Director of National Accounts Restaurant Technologies, Inc. Accidents happen—especially in the kitchen. But are you doing your best to reduce the frequency at which they occur? The National Safety Council estimates more than 25,000 slip-and-fall accidents occur every day in the United States—that’s more than 9.1 million every year. In addition to the physical injuries employees sustain and the subsequent work time lost as they recover, kitchen injuries can also hurt your dining hall’s bottom line. Consider this statistic that even dining hall kitchens can relate to: Restaurants have an average of four workers’ compensations claims each year, for a total cost of $45,600 per locale. There is no secret recipe for preventing injury and increasing safety in higher-education dining facilities. It all boils down to proper safety protocol and training. You might be thinking, “I know everything there is to know about cleaning up spills, turning off burners and calling 9-1-1 in an emergency.” While that may be true, are those action items clearly posted in your kitchen? Have you presented them to your back-of-house (BOH) and front-of-house (FOH) staff, who might be students working their first job in food service? Is the safety presentation part of employee orientation, and do you offer refresher courses every quarter? If you answered “No” to any of those questions, then it’s time for a crash course in setting up a safety program. The Occupational Safety and Health Administration estimates that for every $1 spent on safety programs, facilities can save $4 to $6 in costs associated with injuries and fatalities. Simply put, you can’t afford not to implement safety training. And given the high turnover of student workers in higher-education dining facilities, consistent, repeat training is crucial. Include a safety training module once per quarter at team meetings. Educate workers on basic hygiene and safety protocols. Train employees on the use of first-aid items. Translate training manuals for employees who don’t speak English as a first language. 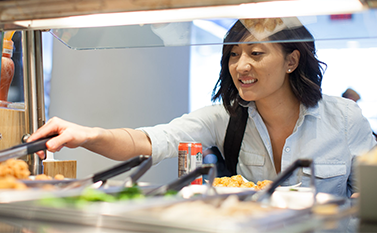 A majority of the injuries that occur in higher-education dining facilities are high in frequency, low in severity, and require minimal medical care. The most common injuries include cuts, lacerations, and punctures (22 percent); slips, trips, and falls (20 percent); burns and scalds (13 percent); and sprains, strains and soft-tissue injuries (15 percent). These types of injuries can often be treated on-site, assuming you have the right supplies on hand and ready. Keep fire extinguishers nearby and inspect them regularly. gloves, and eye protection when appropriate. deduction and a clear policy for safety footwear. The BOH can be a danger zone for student workers ifthe proper precautions aren’t taken. Not surprisingly, the most common BOH injuries are burns and cuts. The National Institute for Occupational Safety and Health (NIOSH) estimates that emergency rooms treated approximately 44,800 injuries suffered by teenage restaurant workers. It also found that teens working in restaurant kitchens are six times more likely to be burned than teens working in any other industry. Fortunately, your employees and student workers can follow several steps to help prevent these types of accidents from happening. Turn handles away from burners. Adjust burner flames to cover only the bottom of the pan. Do not leave hot grease unattended. Use a closed-loop oil management system. Install protective guards on all slicing equipment. Burners, fryer vats, and cleavers aren’t the only potential safety hazards that call the kitchen home. Even the most benign surfaces can become dangerous if not properly maintained. Case in point: Most slips and falls are caused by some type of liquid — such as oil — or other substance on the floor. Of those accidents, nearly 50 percent occur near sinks or fryer vats. Safety starts from the ground up. Display caution signs to identify wet floors. Use floor mats to prevent slips and falls. Don’t allow employees to lift heavy boxesor objects on their own. When it comes to preventing injuries in the BOH, establishing proper safety protocols and training procedures is just the start. Safety isn’t a set-it-and-forget-it exercise, and reducing accidents starts with strong leadership. “It takes time to change the habits of 200 full time employees and 1,500 student employees. It also takes commitment at every level of the organization,” says Stacey Clements, safety, compliance, and training manager, student auxiliary Services at Rochester Institute of Technology. “We have worked for a number of years to build a culture that is conducive to preventing incidents. This started with making sure that all incidents were being properly reported. Many culinary employees see a cut or a burn as part of the job. We had to change that mindset before any progress could be made regarding incident reduction or prevention. We did this mainly through training and showing employees that the reporting process could actually be beneficial.”Armed with these tips and a strong plan of action, you’re well on your way to creating a safer environment for your institution and increased engagement from your employees. Mike Foster is a Director of National Accounts for Restaurant Technologies. He has been with the company since 2006 and works with higher ed, non-commercial and hospitality customers. Mike has a passion for helping customers run safer, more sustainable operations with automated oil management programs that improves operational profitability; food quality; and employee safety, increasing employee engagement, improving safety culture. Slip and Fall Facts, http://www.lighthouseenterprises.us/Hurricone/Slip%20n%20Fall.pdf (accessed September 29, 2016). Fred Blosser, Centers for Disease Control and Prevention, The National Institute for Occupational Safety and Health (NIOSH), “Most Teen Worker Injuries in Restaurants Occur in Fast Food, NIOSH Study Finds,” August 27, 2012, http://www.cdc.gov/niosh/updates/teenfast.html (accessed August 5, 2016).